Daleville Mayor Jayme Stayton Called For The Investigation Into The Daleville Dept. of Pubic Safety - Police Department :: RickeyStokesNews.com! DALEVILLE: The Mayor of Daleville Alabama, Jayme Stayton, asked Dale County Sheriff Wally Olson to conduct an internal internal investigation into the November 24, 2018 actions of the Daleville Department of Public Safety - Police Department. Many comments have been made from people who "think" they know things when they really do not the facts. But let me set the record straight. Mayor Jayme Stayton has been friends with the Director of the Daleville Department of Public Safety for several years. But Mayor Stayton did what he should and asked a independent agency, Dale County Sheriff Department to conduct the investigation. A question was asked by email and we have researched why ALEA - SBI did not do the internal investigation. ALEA - SBI was conducting the investigation concerning the officer who fired his weapon that night. The suspect, Thomas Goulart, pointed and fired his weapon at the Daleville Police Officer who returned fire. With ALEA conducting that investigation it was felt it was best the internal affairs investigation be conducted by the Sheriff of Dale County. AGAIN, please let me be clear...Daleville Mayor Jayme Stayton personally asked Dale County Sheriff Wally Olson to conduct the investigation. FOR THE RECORD - other than on camera last night I have not spoken with the Mayor and not discussed this with Dale County Sheriff Wally Olson. But you can bet on my information being accurate. This incident was the night of the Auburn - Alabama Football Game. When called some of the officers informed the Director of Public Safety they had been drinking. They are reported to have been told to report for work anyway. The investigator assigned was a new investigator. Reports are after this case he saw things were not being operated correctly and he left Daleville Department of Public Safety. Some other officers have left. 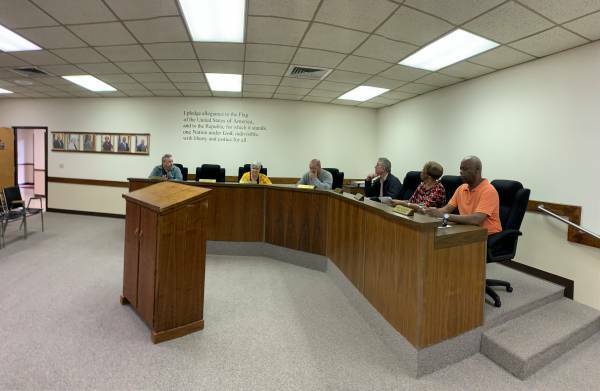 The Mayor and members of the Daleville City Council met last night in Executive Session. They adjourned after the meeting refusing to answer any questions. The Daleville City Attorney, Henry Stegall, said they would issue a statement. RSN asked the question was the Chief ( Director of Daleville Department of Public Safety ) still the Director. Stegall said at this time and a formal statement would be forthcoming. UNCONFIRMED information is that Willie Powell, Director of Daleville Department of Public Safety will be retiring next week. Some other officers have departed already and some will possibly be demoted and reassigned. Regardless if Mayor Jayme Stayton fired immediately, the Daleville City Council could rehire. So some things have to take their course. This investigation came as a result of the shooting death of Chris Goulart, alleged to have been at the hands of his brother Thomas Goulart. Also in the Attempted Murder where Thomas Goulart shot at Daleville Police Officer Sgt. Brian Lusher. Goulart was able to escape in the woods but was later taken into custody and placed in the Dale County Jail..
Goulart has been indicted by a Dale County Grand Jury. Through his attorney David Harrison, Goulart has entered a plea of not guilty by reason of mental disease or defect. The case is assigned to 33rd Judicial Circuit Judge Kimberly Clark. Goulart has been ordered to undergo mental evaluation. Because a officer was under fire many agencies responded the night of November 24, 2018. Dale County Sheriff Wally Olson, Dale County Sheriff Chief Deputy Mason Bynum, and members of Dale County Sheriff Department, Houston County Sheriff Donald Valenza and members of Houston County Sheriff Department, Coffee County Sheriff Dave Sutton and members of the Coffee County Sheriff Department, Geneva County Sheriff Tony Helms and members of the Geneva County Sheriff Department, the Colonel over the entire State of Alabama Department of Law Enforcement - Trooper Division Colonel Charles Ward, ALEA - SBI, and other agencies. Wicksburg Fire - Rescue equipped a ambulance and staged it at Daleville City Hall. The police officers drive the ambulance for Daleville. Wicksburg staged a staffed ambulance for the safety and security of the officers and public. After a search Thomas Goulart was apprehended and taken into custody. Afterwards Mayor Stayton was briefed on some possible issues that were serious in nature concerning officers of the Daleville Department of Public Safefty. Without hesitation Mayor Stayton stepped up to the plate and did as he should and had those allegations investigated. The Mayor received the report last week and called a special Daleville City Council meeting last evening. There was a vote to go into executive session. We do not know the discussion but we understand the enema's are being administered. HATS OFF to Mayor Stayton for being a stand up guy, taking charge and doing as you should.